There are countless products available that are meant to reveal your skin’s natural beauty, but when it comes down to which is best for your skin I believe it’s all relative. It’s extremely important to consult a dermatologist that is trustworthy and honest before using random brands, especially if you’re prone to acne. I have tried many products over the years and have found a skincare routine that’s kept my face clear and smooth for the most part, so I decided to share it with you today. Face wash: By the end of the night, you need to clean off any dirt and oils that have built up throughout the day. 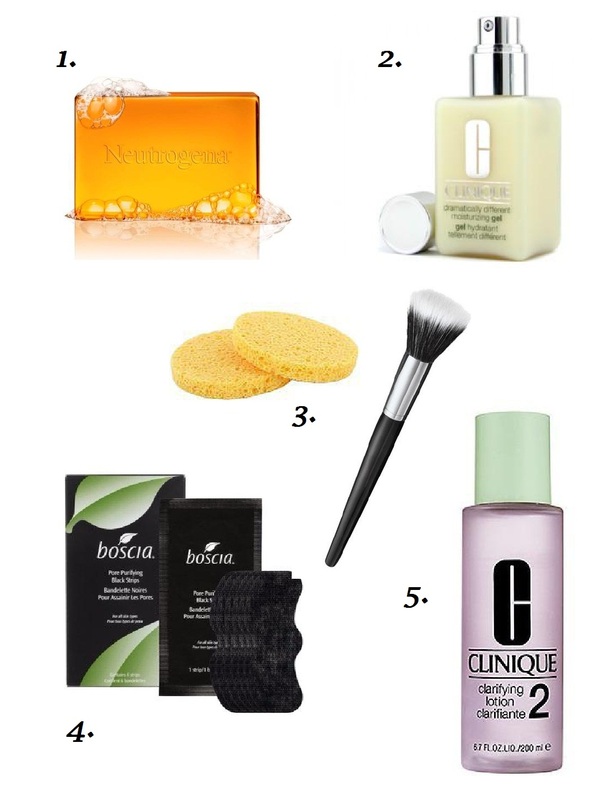 I like to use a mild soap for daily wash (such as Lux) and the Neutrogena Facial Bar on problem areas. This facial bar is not only easy on the wallet, but it contains salycilic acid which fights acne. Moisturizer: Regardless if your skin is oily or dry you need to use a moisturizer on a daily basis. It rejuvenates the skin and keeps it looking plump. I like the Dramatically Different Moisturizing Gel by Clinique because it’s absorbed quickly and is completely oil-free. Treatment: With a busy schedule and a weekend that never feels long enough you may not get a chance to give yourself a face mask, not to mention how expensive a good cleansing facial can be. It’s still important to treat yourself to one on a monthly basis, your skin will thank you for it. I shared an amazing Dewy Skin Mask that I do at least once a week and has done wonders for me. Nose Strips: I think this product is really underrated and should always be available in your beauty closet. Blackheads are extremely stubborn and unless removed by an esthetician can be hard to extract. Nose strips may not be as effective as a steamer and facial but will keep most of your pores clean. When necessary, I like to cut them up and use them on my chin and forehead as well. Toner: I’ve been using the Clinique Clarifying Lotion since I was 19 years old. It balances the oils in your skin, cleans off grime residue and leaves my face extra smooth. It also contains salycilic acid, which like I said earlier can help clear up your skin. They have 4 different toners from Clinique and you should check which one is right for your skin type. I haven’t tried Benefit’s skincare before, but I use their foundation and I love it! Might have to give some of those a try. It’s so tedious when you’re ready to go straight to bed and here you are washing your face and rubbing cream everywhere lol. It’s so important though!